JCB Skip Loader Tires: Whether working with the JCB 200 series or 3C you can be sure you are working on a great skip loader capable of anything you can throw at it. JCB Skip Loaders are often used for grading and there is nothing harder than grading and pulling dirt while having your tires slip beneath you and not having good traction. Monster Tires offers the largest selection of JCB Skip Loader Tires and our professional staff can answer any questions you may have about what tread will be best for your terrain or job site. High Quality Affordable Construction Tires. A JCB Skip Loader is an important piece of equipment for your work site, and one that you can’t afford to have not working. Unfortunately, when your tires wear out, you can’t depend on your JCB Skip Loader to work well or even to be safe on the job site. If you are looking for high quality, affordable construction tires for your JCB Skip Loader, you have come to the right place at Monster Tires. We have the Construction Tread Tires for JCB 3C LL – 212SU Skip Loader you need to get your vehicle up and running again. 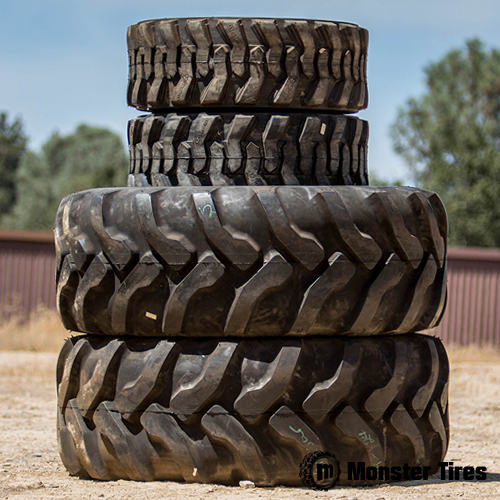 Dependability and Reliability with Monster Tires. When you buy extremely cheap skip loader tires for JCB skip loader, you often end up with tires that wear out fast. This ends up being far more expensive in the long run than just getting good tires would have been in the first place. Here at Monster Tires, we have High Quality OTR Tires for construction companies and home owners. We know how important tires are for your business, and it is our business to get you the best. Trust in Monster Tires for your next set of JCB Skip Loader tires!